This carved oak wardrobe is a beautiful addition to our large selection of antique bedroom furniture. This superb quality solid English oak wardrobe features a large cupboard to centre with graduated drawers below. This is flanked by two full length hanging areas with mirrored doors. This carved oak wardrobe breaks down into five individual pieces for ease of transportation and reassembly. The wardrobe is in good condition for its age, but as you can appreciate, it has received some wear and tear during its lifetime, and it will show marks and blemishes to the polish work. 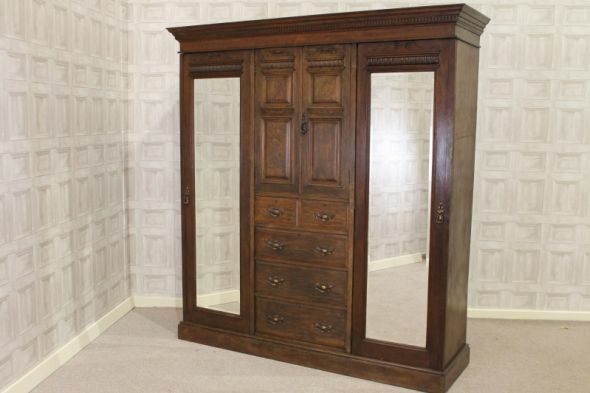 A lovely Victorian solid oak wardrobe; ideal for any period interior.